BART’s Fleet of the Future. There's good news and bad news on BART's new 775-car fleet: The manufacturer has a fix for problems that surfaced during a test run, but it's highly unlikely any of the trains will be in service by Thanksgiving. 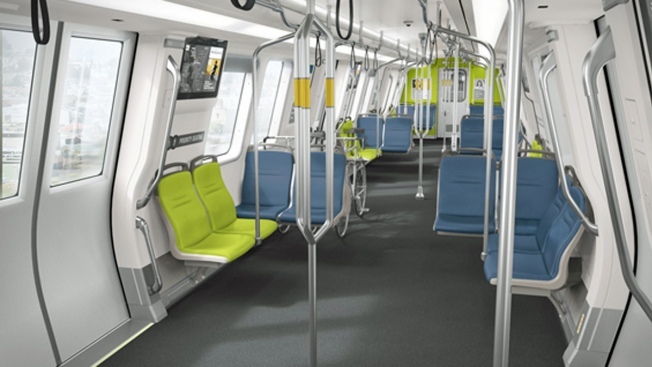 New BART train cars flunked a safety inspection by the California Public Utilities Commission, a state regulatory agency, earlier this month, delaying approval of the cars by the commission. Paul Oversier, the system's assistant general manager, told the BART board yesterday during a board meeting that Bombardier, the manufacturer, has solutions to the issues that came up, according to BART Spokesman Jim Allison. "BART is going through the CPUC's punch list and will be responding to their questions shortly. Then CPUC inspectors need to ride the train with us again," Allison said in an email. He was referring to the fact that after the repairs are made, members of the utilities commission will once again take a test drive. The problems initially surfaced during a test run of a 10-car pilot train with a Utilities Commission team aboard. "So we are aiming to put the 10 new cars into service later this month or possibly early December. Shouldn't be later than December 15th," Allison said. BART had earlier set Thanksgiving as its goal for getting some of the trains into service.